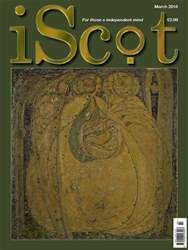 Digital Subscriptions > iScot Magazine > March 2018 > The New Scottish GP Contract – Dell Or No Dell? In April 2018 Scotland’s general practitioners will start working under a new contract model. This has come about after three years of closed door, relatively secretive negotiations. The GPs’ trade union, BMA Scotland, and the Scottish Government are both very pleased with the deal. So everything is fine then – except it’s not and we’ll come to that soon. But first it might be helpful to explain GP contracts as it’s something most non-GPs know next to nothing about. At present Scottish GPs work under several types of contractual arrangements. The majority of GP practices work under a general medical services (GMS) contract and are also known as 17J practices (in reference to the 1978 National Health Service (Scotland) Act as amended in 2004). These GPs follow a nationally agreed contract model. But they are quasibusinesses and the GPs are selfemployed independent contractors. This means that there are some additional services they can opt out of or agree to provide. It also means they can employ their own staff, build and equip their own premises and generally try and match the services they provide to the specific needs of the population they serve. It also means the practices have to ‘make a profit’ if the GPs are to be paid. By contract 2C practices (from section 2C of the 1978 Act) are run by the local NHS Board. In these practices the GPs are salaried employees of the Board. They have less flexibility and less say over how the practices they work in are staffed, equipped and run.